Banging. That would be one word to describe this salad. A feast for the senses. That would be 5 more words to describe this salad. A rainbow bowlful of deliciousness. That would be 5 more words to describe this salad. Crunchy. Salty. Sweet. Tangy. Fresh. Zesty. Creamy. Colourful. That would be 8 more words to describe this salad. Take your pick and let me know which you’d choose. I first made this salad last summer and it’s been on my mind for a while now to remake, taking note of exact ingredients, timings and techniques. That said, it is easily adaptable so I can imagine this would be great with white instead of red cabbage, with broccoli instead of cauliflower and spinach leaves instead of kale. There are a few things I must insist on though: the crunchy coconut chickpeas, the satsumas and figs and the dressing. If you’ve not tried a tahini dressing before, then, where have you been? They are my favourite thing to drizzle over my meals to take one ordinary bowl into an exciting, flavourful event. I always have to make extra because I just know that I can spoon it straight from the bowl. This one is a simple adaptation of my classic creamy tahini with added garlic and ginger to contrast with the creaminess. So take my advice and make some extra dressing to drench your salads with over the next few days! The same can be said for the crunchy coconut chickpeas. 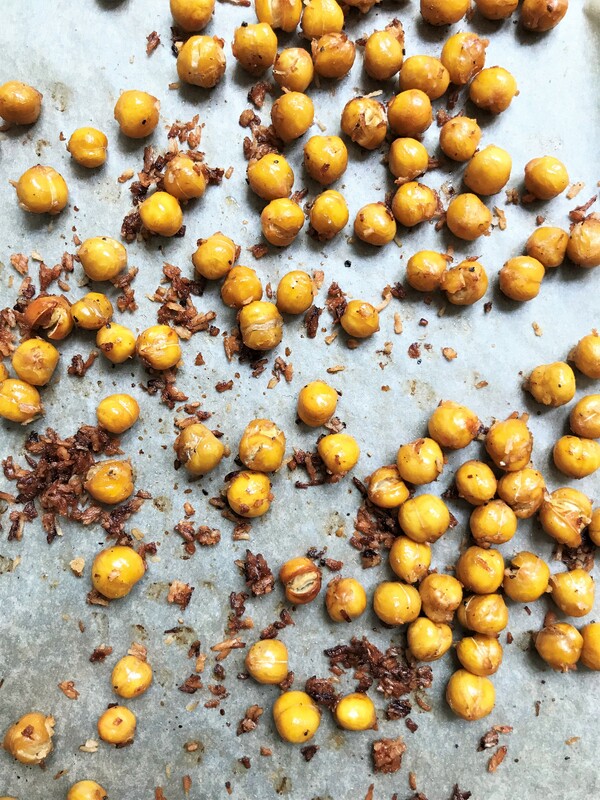 Thanks to the coconut oil and desiccated coconut, these baked chickpeas are actually crunchy and they maintain their satisfying crunch, making them an excellent snack the following day, so feel free to make extra. I hope you’ll enjoy this one… of all the salads this may just be my favourite this year. That’s saying something as I eat an awful lot of kale salads, as I am sure my Instagram followers will know! Preheat the oven to 170Fan/190*C and line 2 baking trays with parchment paper. In a large mixing bowl, toss the cauliflower and chickpeas with the coconut oil, desiccated coconut, tamari and cayenne pepper. Roast on separate trays for 20-30 minutes until turning golden and crisp, turning over half way through and shaking the chickpeas every 10 minutes. Remove from the oven. In the same mixing bowl, massage the lemon juice into the kale with a pinch of salt until it wilts and turns bright green. Add the red cabbage to the bowl and mix in with the satsumas, figs and coriander. In a small bowl prepare the dressing by mixing all the ingredients together until creamy. Add a splash of water, if needed, to make a pourable consistency. Season to taste with salt and black pepper. 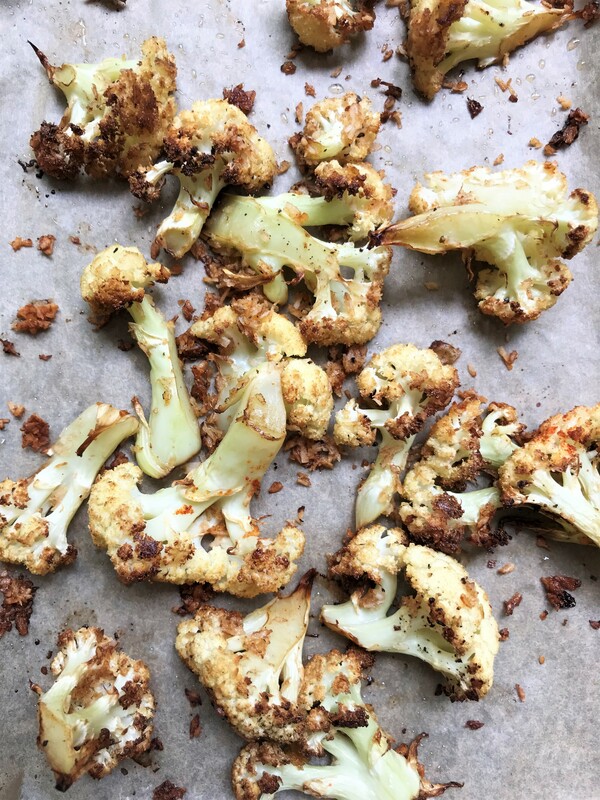 When the vegetables have finished roasting, add the cauliflower to the kale mix and divide between two bowls. Now top with the avocado slices, crunchy chickpeas and drizzle over the tahini dressing. Add any desired toppings. This is best eaten straight away, although components will keep well for the next day in separate airtight containers in the fridge. Have you made this super salad? I would love to hear your thoughts, how you’d describe this meal and whether it will feature in your meal planning. Please leave any comments below and/or tag me in your creations on social media. I’m @nourishing.amy on Instagram and use the hashtag #nourishingamy. I love it and hope you will too! nice version. will try by the weekend ! oh great – let me know what you think!